Click on Admin, and then hover over Reporting and click on Overview. On this page, there are several options for filtering and viewing your report. If you want to see how mastery has progressed over time, click the View drop-down menu, select Timeline, and then click Apply. On the timeline view, hover over each month to view detailed mastery levels for that time period. Use the Subject and Core filters for more specific reporting. Don't forget to click Apply after you've made your selections. Note: To view reports from previous years, use the School Year drop-down menu. 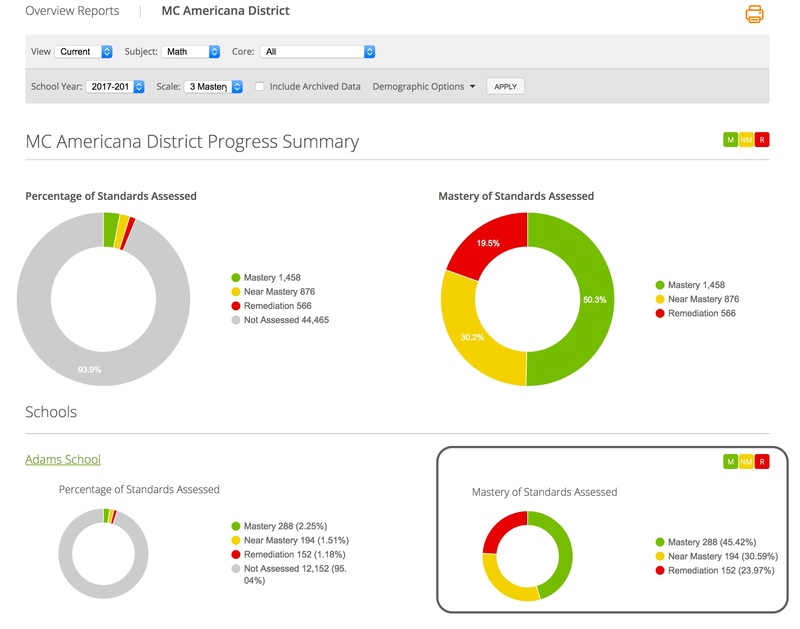 If your district is synced with an SIS, you have the option of sorting reports by student demographics. Click Demographic Options, and select the student group for which you want to view reports. Click on the pie charts at the school level to view reports at the grade and class levels. To print a report, click on the orange menu button on the top right.